Hi again lovelies! So I am quite behind in my blogging assignments of late and it dawned on me that I am WAY overdue to share one of the most important ones of all! 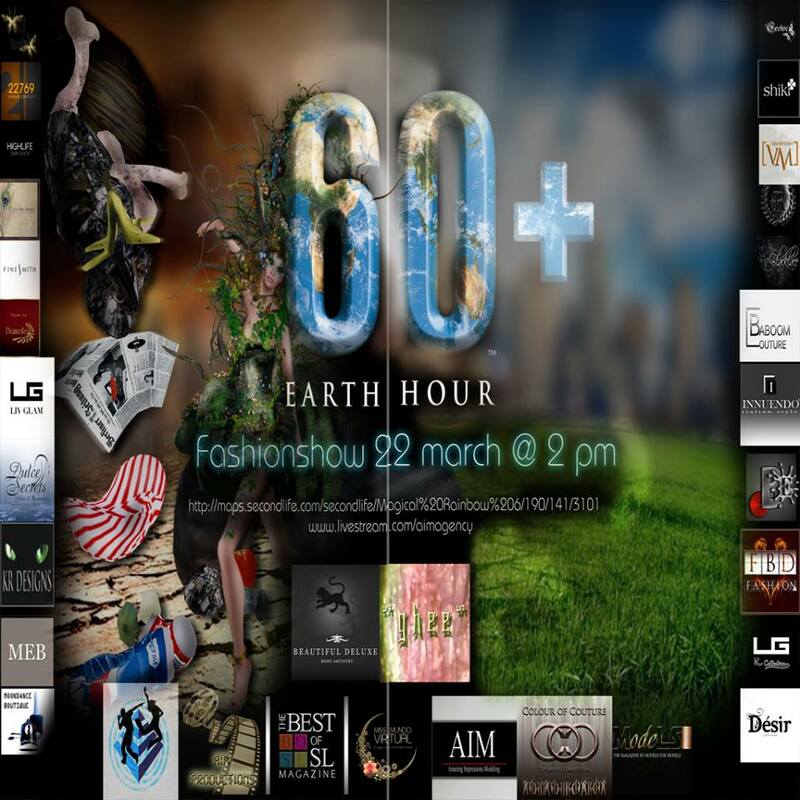 Here is my styling for the “Earth Hour Challenge” in this years Colour of Couture Top Model Competition. Can you tell I had a lot of fun with this one? The Earth Hour show took place on March 22nd (see I’m only a month late), and was quite an event. As you can see there were countless designers sponsoring the event, and it was the live runway debut of the Colour of Couture candidates. Our challenge? 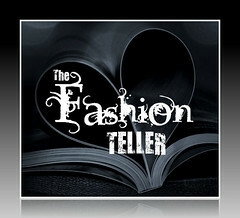 “FOR EARTH HOUR YOU WILL STYLE COSMO COUTURE. THIS WILL BE FUN AND WILD SO THINK OUTSIDE THE BOX HOWEVER; YOU WILL HAVE TO USE YOUR PRIMARY COLORS OF BLUE/GREEN TO REPRESENT THE EARTH.” I hope you enjoy my interpretation. !NEWNESS! Miamai Luxe Collection, Truth Hair, and Yummy Accessories!! Happy Sunday my loves, hope you all had beautiful (if not short) weekends. Today I finally got the chance to visit Rico’s Tea House, an absolutely lovely new SIM created by decorator extraordinaire RicoRacer Flux. Now open to the public, Rico’s Tea House is the perfect place to come and relax, take gorgeous photos, and people watch (you are sure to see some of SL’s most fashionable enjoying the tea and sunshine). What could be better for Sunday brunch than Miamai’s new silk jumper, the Bianka, just released as part of the new “Luxe Collection”. And luxe it is…available in several colors and patterns, Bianka includes a HUD with options to change the look of the belt, as well as “normal” and “high heel” options in pant length. I could just feel the silk against my skin this morning as I enjoyed a cup of coffee and watched the ships sail by. A perfect end to the weekend, indeed. 3 more days for the LD Oh ZOE BoHo Mini-Collection at the Fashion Collective! Hey my lovelies, hope you are all having wonderful weekends! Here is another one of my favorite pieces from the Loovus Dzevavor “Oh ZOE BoHo” mini-collection, available exclusively at the Fashion Collective through April 15th. LD was inspired by the modern day Boho Glam goddess, Rachel Zoe, when creating this 7 piece mini collection. It features flowy tops, palazzo pants, crochet, and of course our signature vibrant colors and patterns! This collection will transition you perfectly from Spring to the balmy days of summer, and bring out the free spirit in you! New R2 Fashion @ Collabor88! Hey hey lovelies, have you checked out the latest round of Collabor88? This was one of my favorite finds and I couldn’t wait to share. Meet the new A/D/E Reijin dress in Gold by R2 Fashion. This avant-garde, futuristic dress comes in several colors and has a one of a kind silhouette which I just adore. I was actually looking for something for an Alexander McQueen inspired styling assignment, so you may detect some of his trademark looks in my look as well. Head on over to the April round of Collarbor88 this weekend, it’s a great round! What is up my loveliiiiiiiies?? 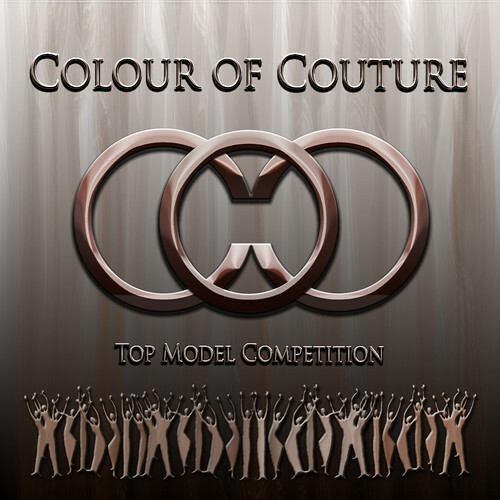 As most of you know, I have the great honor of competing this year in the Colour of Couture Top Model Competition. 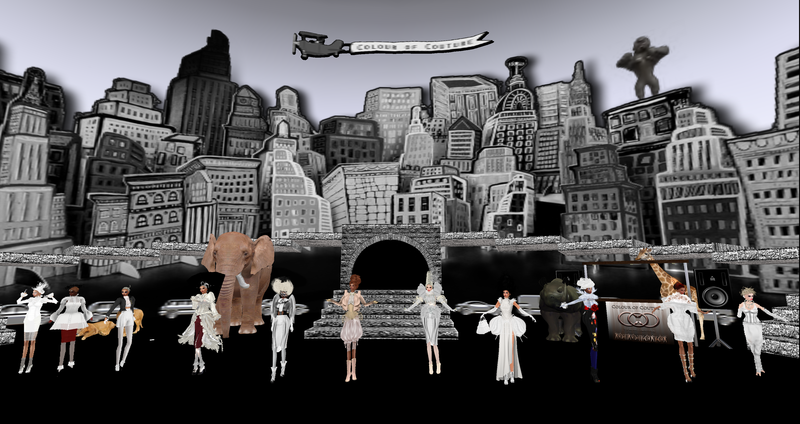 It has been my most challenging endeavor to date in my Second Life and the stakes are getting higher! 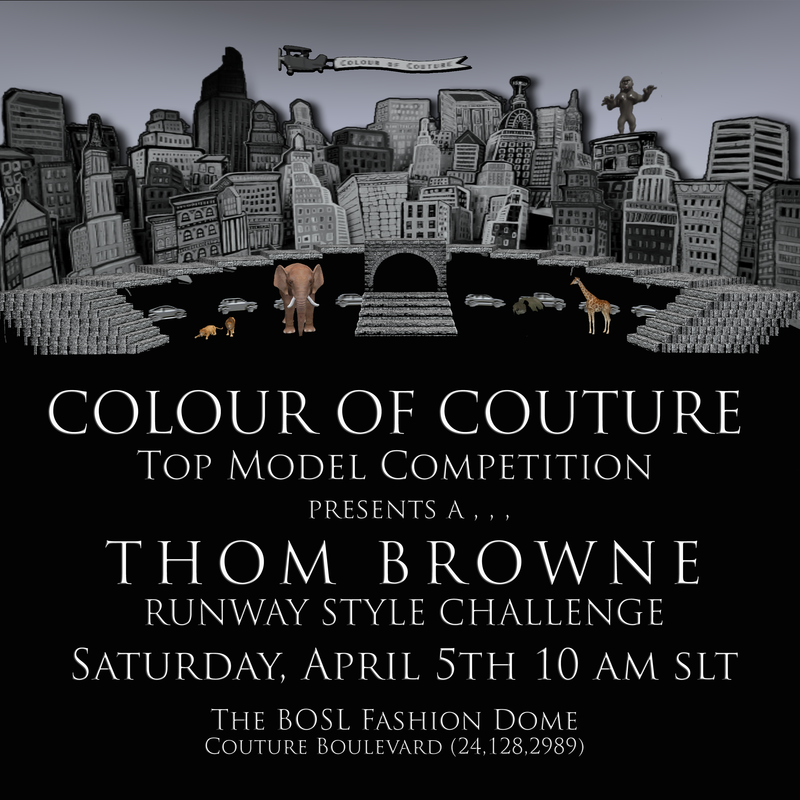 Our second Runway Challenge for the 2014 Colour of Couture Top Model Competition was to style a look inspired by the Thom Browne Spring 2014 collection. In what was considered possibly “the creepiest” show from NY Fashion Week yet, Browne’s RL designs were displayed on a runway as cold and sterile as a mental hospital complete with surreal “nurses” and “mental patients”. 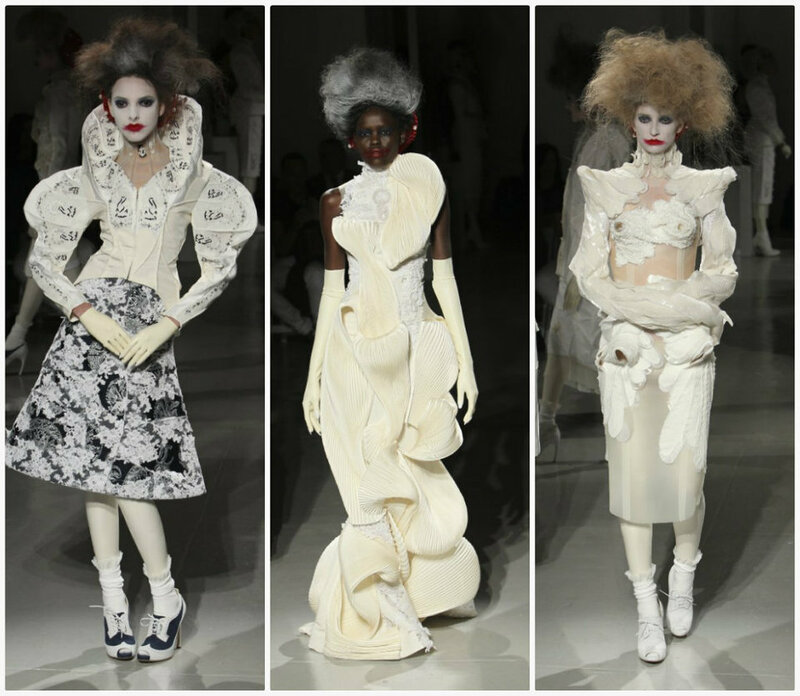 Browne mixed this macabre ambience with a one of a kind blend of Baroque (all white, ruffled collars, exaggerated shoulders) with an almost 1940’s sensibility (bobby socks, snoods, pencil skirts). These elements combined with Browne’s idea of putting a “clown” on the runway (he had never seen one in real life), inspired one of the most talked about collections of the season. While styling my interpretation of this collection, I focused on the themes of Baroque, tones of white, and the idea of being caged and somewhat deranged. All 14 contestants excelled at this styling and it was a show to remember!